Janet is a very hardworking young girl who holds several leadership positions in her school, including the Secretary of Education. As the Secretary of Education, she makes sure that the learning process is ongoing for all students in the school. This role has also given her the chance to attend seminars and trainings on the importance of education. This has opened her eyes to a life beyond the village she comes from, and given her hope that she can be successful if she puts more focus in her schoolwork. As the youngest in her family, she has seen first-hand her older sisters married off at young ages, and her older brothers working menial jobs in Nairobi town. Her brothers earn very little in these jobs, but every little bit counts in helping their single mother and their aging grandmother. Janet is very motivated, and believes that she is the one that will help her family out of poverty. In order to do so, she has maintained the top position in her class throughout the year, usually earning about 350/500 marks. She has asked the school administration to keep an eye out for any financial assistance to help her stay in secondary school. Janet is an active member of her village’s community, and she is well known as being a very helpful girl. She goes to church every Sunday morning and helps the younger read their Scripture. She is determined to become a doctor in the future, and we know she has a bright future ahead of her. 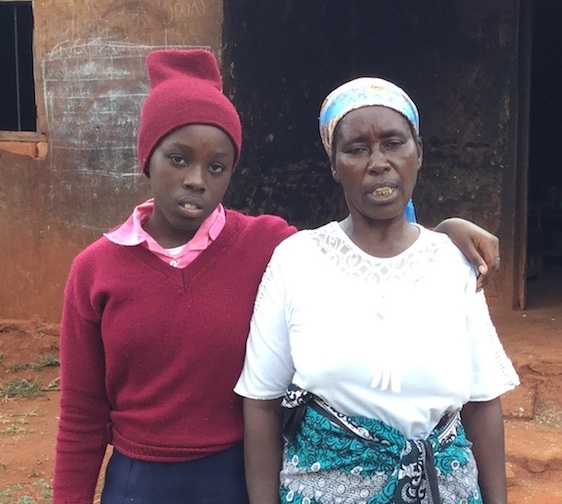 To achieve her goals, she needs help to join secondary school. She will need financial assistance with paying for school fees, and buying basic school supplies and personal utilities. Help Janet become a successful person, like she dreams of, by sponsoring her today!